We are in a “Golden Age” of addiction research. In recent history, our scientific understanding of how and why addiction occurs is growing in leaps and bounds. Lisa M. Najavits is adding to this knowledge base. In fact, she has developed a counseling prototype to help people facing traumatic events and substance abuse. We interview her in this exclusive Q&A. More here. Nearly everyone faces some kind of trauma in their lives. Whether this is the death of a loved one, the loss of a job, or a form of abuse, we all have seen our share of struggle. But how we handle the stress, pressure, and pain this trauma causes varies from person to person. Some of us don’t know where to turn and find solace in drug use. Addiction and childhood trauma also drives addiction. When children experience trauma at an early age, many become victim to post-traumatic stress disorder (PTSD). This is a condition where mental and emotional stress occurs due to triggers of a past traumatic event. As children enter adulthood and find they are continuously dealing with PTSD, many turn to drugs and alcohol as a means of relief. Luckily, the connection between painful experience and addiction is slowly receiving attention from treatment professionals. We’re grateful to call upon the experience and expertise of Dr. Lisa Najavits to learn more. Discovering the right support group. Setting goals for the future. A counselor herself, the book tells stories through the voices of those who’ve lived through trauma…can come out the other side. Let’s learn more about her message…and explore how this book can help you resolve past and present problems. ADDICTION BLOG: Dr. Najavits, thank you so much for joining us! What’s one of the first signs that signals unresolved trauma? How can we know if we’ve been through trauma, especially if our subconscious mind is trying to suppress the experience? LISA M. NAJAVITS: I’m happy to be here, and appreciate all that you’re doing to spread the word about the linkages between trauma and addiction. Signs of unresolved trauma include four core types of problems. 1. The first is called re-experiencing, which means the trauma keeps coming back into mind, unwanted. For example, the trauma may show up in nightmares or flashbacks (which are like brief movie clips of the event). 2. The second main type is avoidance, not wanting to talk about it; it feels too distressing. 3. The third is negative thoughts and mood, such as feeling damaged, depressed, having repeated thoughts of revenge, etc. 4. The fourth is arousal, strong physical responses when reminded of the event. This can include symptoms such as heart racing, jumping at sudden sounds, and being continually hyper-on-guard against further danger. These four types of trauma problems are part of the diagnosis of posttraumatic stress disorder (PTSD) for ages 6 and above. Even if someone is trying to suppress or avoid focusing on trauma, it generally shows up in these various ways. ADDICTION BLOG: What usually causes someone with past trauma to seek treatment? For example, are breakthrough moments common? LISA M. NAJAVITS: Often, the launch into treatment occurs when some part of their lives becomes so overwhelming that they can’t handle it on their own. That is a common pathway for people who have both addiction and trauma problems. There can be a downward spiral where the trauma problems lead to addictive behavior, which leads to worse trauma problems, etc. Another pathway is that a caring person in their lives helps them find treatment, or yet another is that the person gets identified as having problems due to issues such as homelessness or criminal justice involvement. As for breakthrough moments, in my experience, I think it’s usually more of a pathway of incremental change based on the person striving toward recovery through repeated actions—such as attending treatment, reading, building a support network of safe people, taking care of their body in healthy ways, etc.. It looks different than in the movies, where trauma recovery is often portrayed as a dramatic breakthrough or catharsis. ADDICTION BLOG: Do men or women typically experience similar traumas? Or are our traumas different based on gender? LISA M. NAJAVITS: Good question. Men typically experience more crime and combat-related trauma while women typically experience more sexual assault. And LGBTQ tend to experience higher rates of trauma than non-LGBTQ. But in general, all genders experience all types of traumas. And what matters most is the experience of the individual. What did the person suffer? What meanings and interpretations does the person have about what happened? ADDICTION BLOG: Is trauma best treated with professional help? Or can people handle trauma on their own? LISA M. NAJAVITS: I’ll reframe your question to refer to “formal help” rather than professional, as there now, more and more, peer services as well as professional services. Peer services are provided by people who themselves are in recovery from trauma and/or addiction and this, too, is an important avenue of help. In general, if someone has ongoing trauma and/or addiction problems that don’t go away, seeking help (professional and/or peer-led) sooner rather than later is recommended. It’s just like any medical condition such as a toothache, diabetes, etc., where the sooner the person gets help, the better. But people can reach out for help at any time. I’ve worked with people who never addressed trauma until many decades after it occurred, and they did fine in their recovery work. The same with addiction. So, it’s never too late is the bottom line message. And, yes, it’s true too that some people successfully handle trauma problems on their own as well. But if it’s not getting better, don’t be alone with it—get help. ADDICTION BLOG: If a reader is considering seeking help, where should they go RIGHT NOW in order to schedule an appointment to see a professional? Can you share some treatment resources for our readers, please?! (c) Sidran Institute help desk. And the Seeking Safety website has some opportunities to participate in our research and receive some support via that. ADDICTION BLOG: Do you suggest that readers use your book as a complement to trauma and addiction recovery? Or can the book be used as a primary treatment tool? It was designed as self-help in the sense that it’s written for the public rather than for professionals, so it emphasizes uplifting, practical, and non-triggering, content. But it can also be used as treatment. A counselor can use the book as a primary treatment model, taking a new chapter each week and going over that. Or it be an adjunct to treatment, such as a group model while the client is also doing many other treatments. In short, it can be used in many different ways depending on the needs of the person. ADDICTION BLOG: You outline steps to recovery in the book. Do you think that ONE STEP is particularly crucial? If so, what is it? LISA M. NAJAVITS: There is no one step, but rather many options. It’s a highly flexible approach and people are encouraged to go through the chapters in any order, based on what is most resonant and relevant for them. Recovery is a fluid and creative process and the book’s approach mirrors that. If there’s one key idea it’s to do something, anything, right now to promote your recovery—but what that looks like will be different for each person. The book strives to open up possibilities and inspire people toward their best self. ADDICTION BLOG: Through your writing, did you learn any important lessons or information that you weren’t expecting? LISA M. NAJAVITS: Writing is always a process of discovery for me, so yes, there was much new learning along the way. In particular, I can point to one facet that was especially meaningful: the Recovery Voices section of each chapter, in which someone in recovery talks about how they relate to the chapter topic. Hearing what they said deepened my understanding of each chapter. For example, real people who’ve been through the process of recovery often had metaphors that brought the ideas to life: “turn your face to the light,” and being “like a scuba diver” who follows the bubbles of water that lead to the surface, back to safety. These helped inspire the chapter Create a Healing Image. ADDICTION BLOG: Do you find it common that people have misinterpretations of the connection between trauma mental health and/or the work that you do? Do you find professionals even have a bit of trouble connecting the two? LISA M. NAJAVITS: Yes it’s very common. Sadly, there is often a judgmental and harsh view of people with addiction. But the reality is that most have histories of trauma that help explain their addiction. As it says in the book, it’s not the substance (or food, work, gambling or other behavior) that’s addictive. After all, most people who drink alcohol, gamble, eat, work, etc. don’t become addicted. Thus, it’s a complex and often unpredictable relationship between the person, and the person’s current context and past history. Both professionals and the world at large often make major assumptions about addiction that don’t honor this complexity. ADDICTION BLOG: How do you hope this book will impact the field or psychotherapy? Where do you hope to see treatment advance in the coming years? 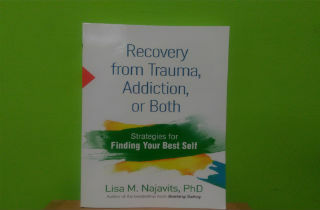 LISA M. NAJAVITS: I hope it will have impact in helping to create greater compassion and also more practical help for those with trauma and/or addiction. There remains much stigma and misunderstanding on these issues. ADDICTION BLOG: As you continue your work within the field, what is your goal as a writer and mental health expert? What kind of impact are you hoping to leave as your legacy? LISA M. NAJAVITS: Some of my current projects focus on peer-led and technology-based options to improve care. Both have potential to be more scalable and thus more accessible than traditional treatment. After all, most people with trauma and/or addiction never obtain professional care. So I hope to take content, such as that in this new book, and apply it using methods such as this to create greater access. From a public health standpoint, there are many, many people who need help but don’t get it. ADDICTION BLOG: Do you have any piece of inspiration you can leave for our readers who are currently handling trauma and addiction? Anything that you’d like to add? LISA M. NAJAVITS: There’s a chapter in the book called, The Decision to Grow, that describes how openness to new learning is the basis of recovery from both trauma and addiction. That learning can happen in many different ways: through people, books, treatment, self-help, movies, and other sources. Whatever way works for you, make that decision to grow and learn. Books: Books like “Recovery from Trauma, Addiction, or Both” are a good place to start self-help and healing. Often priced at under $20, these books can get you started t understand trauma and how it impacts your physical and mental health. Individual Therapy: A one on one which will allow individuals to discover the source of their problems while also finding ways in which to reduce cravings and potential relapses. Group Therapy: A communal discussion where every member is facing problems of PTSD and addiction. Meant as a way in which people can work together to understand how to better handle their stress. Family and Couples Counseling: A way in which family members and/or loved ones can learn about both trauma and addiction in order to better understand how to support the affected individual. 12-Step Meetings: Often, people find inspiration to move past their trauma in group settings. Similar to group therapy, it involves a community of people who work together to inspire one another. Medication: Specific medicines may be prescribed in some cases for the relief of drug withdrawal symptoms, to treat drug cravings, and to address mental illness. These include antidepressants or anti-anxiety medications.